Changing behavior isn’t easy. Not only does it take a lot of hard work, but it requires a concrete process that you can trust and follow on a daily basis. Most training courses give you great content, but if that content isn’t deployed or delivered effectively, it is a waste of time and money. Many organizations not only look for great content, they also look at the entertainment factor: Is the training fun? Is the speaker engaging? Did we get positive feedback from the participants? All of these are important, but you can have a perfect score on all of these and your training can be a total flop simply because the participants can’t apply the principles. It’s not because they aren’t capable of learning and applying the principles, but because the deployment methodology isn’t effective. Too often content is delivered too quickly and too much information is given. It’s like drinking from a fire hose, causing them to forget most of what they learned in 48 hours or less. Then I ask, “How much of the training is actually being applied 3 months later?” The answers are almost always well below 10%. That’s a lot of money being spent on information that is quickly forgotten, and not applied! 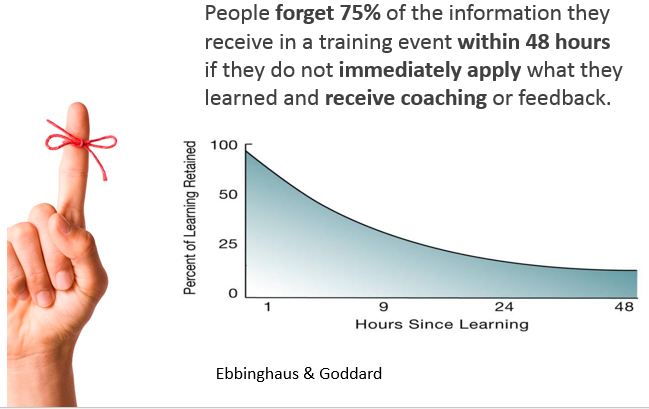 There is a study by Ebbinghaus and Goddard that proves we typically lose approximately 75% of what we just learned within 48 hours. After 3 weeks the forgetting curve is at 93%. That is 7% retention across the board, unless there is accountability to apply the material. But let’s be honest here and admit that the vast majority of the time the accountability to ensure application of the training material is left up to the managers, who have oftentimes never been trained in facilitation techniques, or how to coach their people. It all looks good on paper, but the forgetting curve is seldom overcome. Even at 25% retention, that is a lot of time and money wasted. With the consistency of follow up coaching, studies show that retention can be as high as 87% after 30 days. What does this mean? Your training needs to have follow-up coaching built into it for greater comprehension and accountability for application! Just having follow-ups isn’t enough. They have to be spaced out appropriately. Spacing effect studies indicate that having the follow ups too close or too far apart decreases recollection and application of the material learned. A month apart can be too long. People forget about the training and simply rush to do the homework. It’s more of a reminder of what they should be doing, instead of holding them accountable to applying the principles on a daily basis. Follow-ups that are too close together can create information overload, and retention rates will decrease making your follow-ups ineffective. For soft skills training, we have found that one week is the perfect amount of time to apply what they are learning, and not so long that they forget about it between follow-ups. These are not reminders to see if they can get a question correct, but follow-ups with groups of their peers to learn from each other, share experiences and to be held accountable to applying the information. We have seen two weeks apart work too, but the further apart the follow-ups are the less effective they become as daily accountability begins to decrease. Organizational fragmentation is a consideration as well, so effective group follow-ups by phone is an important option to have, as many organizations have team members all over the nation or even the globe. Ignoring the spacing effect of retention can cost your organization thousands of dollars in wasted training, and greatly reduce the ROI of your training efforts. Studies show that if follow ups have too much information in them, participants won’t be able to retain it all. Recent research has estimated working memory capacity to be about four (4) pieces of information at a time. This also explains why 1-3 day training sessions are ineffective, no matter how enjoyable they are. Having a 1-3 day training is fine, if it is only meant to introduce concepts to your people. Because of the limitations of working memory it is unreasonable to expect any of your employees to remember more than 25% of the skills that were talked about, let alone be expected to put them into practice. This principle also applies to the follow-up process. The information must be broken down into fewer than five pieces of information per follow-up if you expect them to remember to apply them throughout the week. So, what does all this mean about training today? Well, it simply means that for training to be effective you have to make time to follow-up with the participants if you want to get the greatest return on your investment! Deployment matters! The greatest content in the world is useless if it isn’t deployed effectively. If you are evaluating a training program and it doesn’t have a proven successful follow-up component, you better adjust your expectations to less than 25% retention, and an even lower percentage rate of actual application of the information learned. If you want more out of your training dollars, we would love to talk with you on how you can overcome the forgetting curve, the spacing effect and the limitations of working memory. You can find us online at http://www.JohnnyWalker.Co or call us at +1 (770) 456-5547. Johnny Walker is an executive coach, and corporate facilitator and speaker. As a licensed channel partner with Integrity Solutions, and the author of Foundational Core Values training, Johnny offers concrete processes that enable your people do what they do best, more often, more consistently and more effectively. Visit www.JohnnyWalker.Co and www.FoundationalCoreValues.com for more information on how he can help you and your team make it to the next level of success! This entry was posted in Coaching, Leadership, memory, money, personal growth, retention, ROI, sales, service, Success, training. Bookmark the permalink.